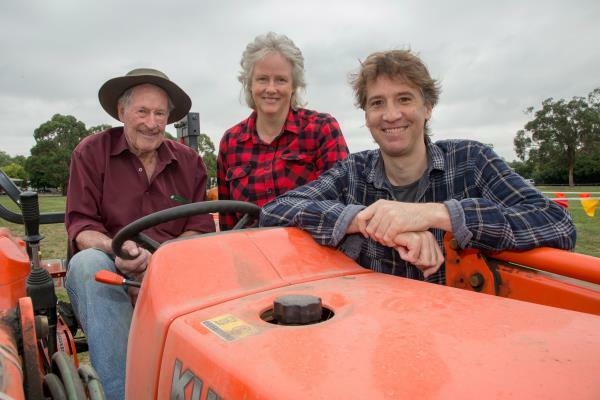 From left, Jack Rae OAM and Anne Reynolds, who feature in the newly released Berwick Show documentary, sat down to have a chat with its director Matt Wheeldon. A BERWICK Show documentary, which was three years in the making, was finally been released for the community last week. The half-hour documentary goes behind the scenes of one of the oldest shows in Victoria, collating footage from the 2012 and 2013 Berwick Shows ahead of this year’s event, which was held last weekend at the famous Akoonah Park. Filmmaker Matt Wheeldon of Hook Turn Films was born and bred in Berwick and always wanted to put together a film chronicling the history of his favourite show. Matt said the Berwick Show documentary was made with the help of his 20-year-old nephew Sam, who is also an aspiring director. He said it was put together free of charge and had been one of his most rewarding projects. “It’s a love project,” Matt, 47, said. Matt and Sam made the film using a small consumer camera which Matt admitted was a bit “rough around the edges”, but allowed the pair to access a lot of people for the documentary. And while he hadn’t intended to spend three years on the film, Matt said it soon became apparent it would be a long-term project. “There was just so much happening at the show and it was impossible to film it all in two days,” he said. With the 2015 Berwick Show scheduled for this weekend, Matt said now was as good a time as any for people to reflect on the long running event. “The film is online for everyone to enjoy, Berwick is one of the oldest community shows in Victoria,” he said. “We appreciate the idea that it’s a throwback to a bygone area, it’s a 1950s sensibility for people. To see the Berwick Show documentary visit the Journal’s Facebook page at www.facebook.com/CranbourneBerwickNews. ???????? For more information on the Berwick Show, visit www.berwickshow.org.au.